Seriously. It's not. And no, it's not an image of an ant, either. In fact, the creature you see pictured up top isn't even an insect. Can you guess what it is? Here's a hint: count the legs. Count em? Eight. Eight! Those aren't antennae you see pointing forward, those are the forelegs of a Ugandan jumping spider — a Ugandan jumping spider that really wants you to think it's a Tetraponera twig ant. 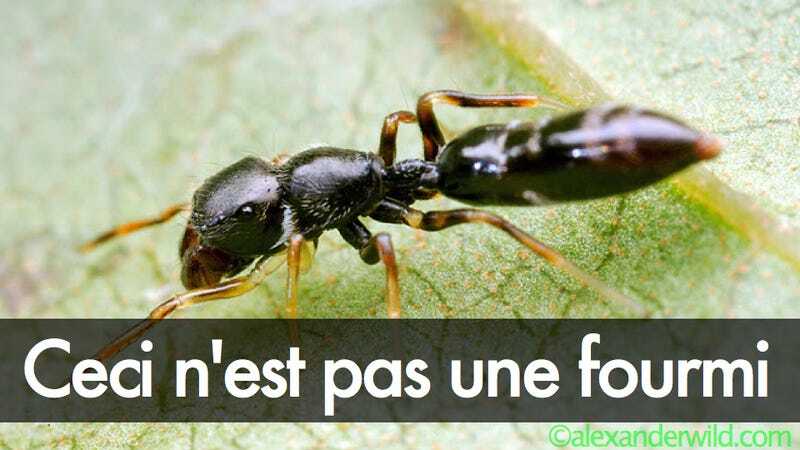 Explains the ever-excellent photographer/blogger/scientist Alex Wild: "most birds and other vertebrate predators prefer not to eat stinging ants, so the spider may gain some protection from its fakery." That's some mighty fine mimicry, right there. Hat tip to Sian for the tip. For more gorgeous photos of (and generally cool information on) bugs, check out Wild's photography website and blog.